“Working consistently, with positive attitude, learning and earning, with vision and good character are the secrets of happy life even after 70 years of age”, said former Maharashtra Chief Minister and former Lok Sabha Speaker Dr Manohar Joshi. Dr Joshi was delivering lecture on ‘Vay Avaghe Paunshe’ (Age only 75), as a part of Sanmitra Lecture Series, organised by Sanmitra Sabha, on Friday. The subject ‘Badalte Rashtra Aani Badalta Maharashtra’ which was published in the invitation card, was changed for the reasons not known. Dr Joshi, who is author of the book with the title same as subject of Friday’s lecture, spoke about his life. Quoting several examples, he stated that even at the age of 82 years, he continues to work with same dedication. His early life in great difficulties, pursuing education upto PhD (at the age of 72 years), reading and writing with the aim of development of the nation. He also spoke about his association with Shiv Sena founder Balasaheb Thackeray and lessons learnt from him. The party and the leader worked with a mission, without paying attention to caste, creed or religion. This helped him (Joshi) to rise to the position of Mumbai’s Mayor, Maharashtra Chief Minister and then Lok Sabha Speaker. Dr Joshi said that he is of the opinion that even a person contesting municipal elections should at least be graduate. Education helps in better thinking. Dr Joshi also referred to his other books ‘Jeevan Kase Jagave’, ‘Dhandha Kasa Karava’ and ‘25/50/75’, to explain earning through business, leading happy life and staged of life at 25 years, 50 years, 75 and later. The ignorance of elected leaders at various levels, is a major hurdle in progress of the nation, he said. While emphasising importance of education and reading Dr Joshi reiterated that one should never lead an ordinary life. Life with high ambition, wider vision can be achieved with good education, determination, hard work, strong will power and good character. For achieving this money is needed, which must be earned. Nikhil Mundle was in the chair. 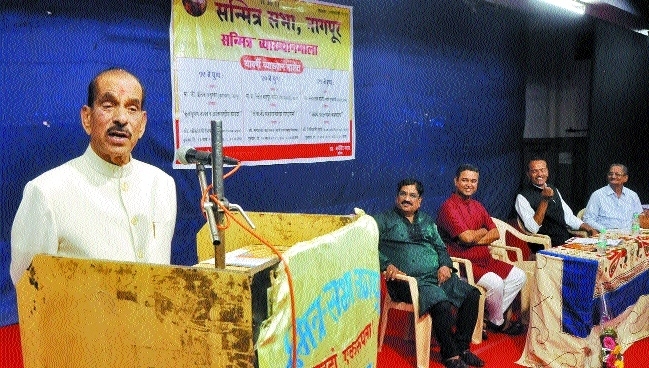 President of Sanmitra Sabha Dr Sanjay Ghatate, Vice-President Prabhakar Belsare and Secretary Arvind Garud were seated on the dais.Shilpa Nandanpawar conducted the proceedings. Dr Tanuja Nafde, who composed ‘Shankhnad’, which was used during Republic Day parade, was honoured at the hands of Manohar Joshi. It is very difficult to understand Nationalist Congress Party leader Sharad Pawar. His careful use of words never caught him on wrong foot, Manohar Joshi stated, while referring to personalities mentioned in his book. He also stated that Pawar’s ‘Not contesting elections’ remarks also is difficult to believe. No one can anticipate what move Pawar will play at what time, Joshi remarked. The remark came while referring to personalities like Babasaheb Purandare, Pratibha Patil, Ramesh Deo, Madhu Mangesh Karnik, Ram Jethmalani, Ajit Wadekar and others mentioned in Joshi’s book.